If you ask me what I’d love to do over the weekend, I will tell you, it is to be able to spend more time with my son. 🙂 Any activity as long as we can spend time together and have fun. But it’s a bonus if we can go out and play in the mall or park. lol! Our weekend turned out well, it wasn’t extraordinary but it’s safe to say we had fun, and that’s what really matters. 🙂 hehe. I had to go to SM San Mateo to by a gift to our neighbor who’s celebrating his 7th birthday, Nate calls him Kuya Philip. So while there, we went to Nate’s favorite: he already knows where it is – his the basketball stall in Quantum. No photo since I had to hold him carefully, lol. After our basketball in Quantum, Nate had fun at the playhouse in Kids @ Play (I already posted about this playhouse before). We stayed there for 30 mins while waiting for my sister to arrive. He played with the slides and balls. But most of his time was spent in the little kitchen corner where he enjoyed “cooking”. 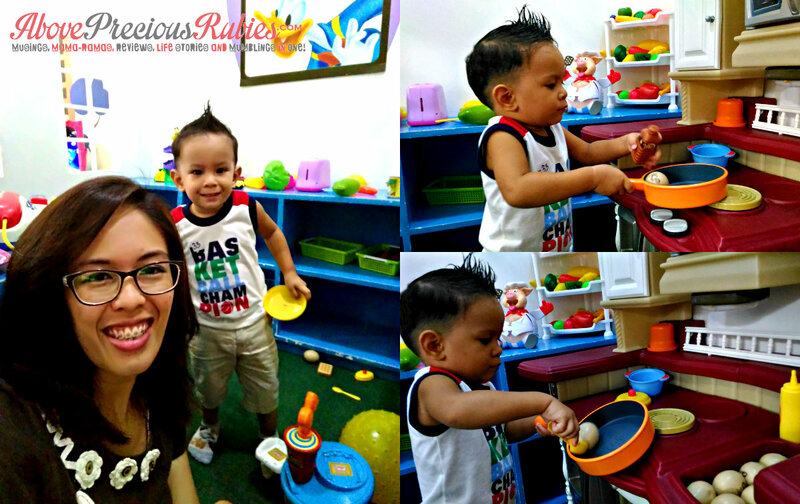 Wow, he’s really a good observer, he knows how to use the stove and pans, he “cooked” eggs. lol. 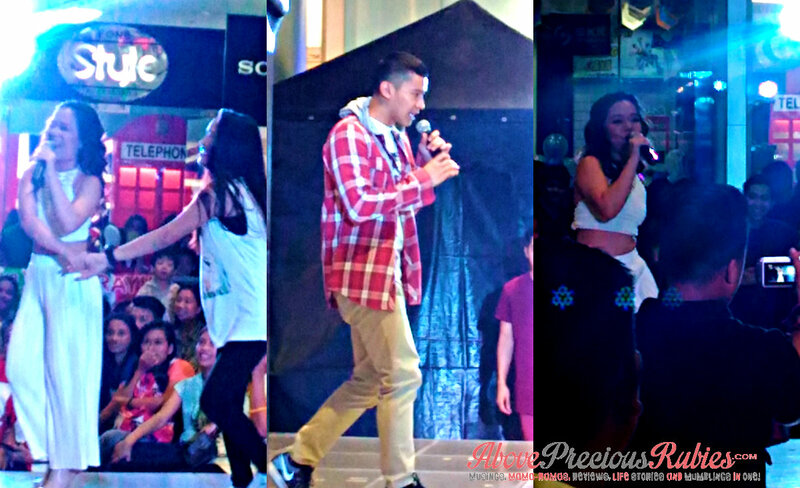 Well, we didn’t know Enchong Dee and Kiray, with the casts of “I love you to Death” were there (SM San Mateo). So my sister and I stopped by to see them in person. lol. Enchong looks taller in person than he is on cam. And Kiray is perky and funny as always, she’s beautiful, I really like her personality. 🙂 I’ve only seen a few celebrities, all of them, I see unintentionally. I don’t go to celeb events but it’s amazing when you hear their fans scream. haha. 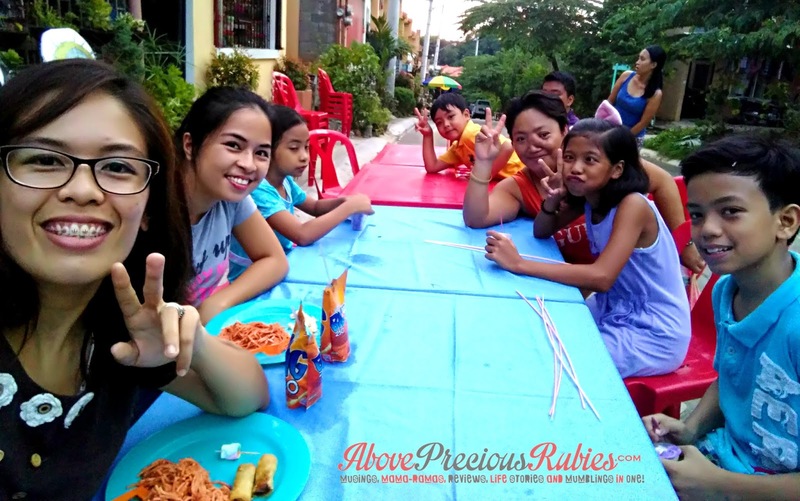 We arrived late for Philip’s 7th birthday (blame Enchong and Kiray! haha). We got home during their last game. So I just handed my gift to Philip. At this time, Nate was already tired so he slept. They rented a videoke for Philip’s birthday so I sang a few songs. lol. Everybody loves videoke, right? We arrived at the church earlier than usual yesterday. I hope we’ll not be late next week. We’re trying to wake up as early as we can in order not to miss our Sunday worship service. After worship service, we had to leave for my doctor’s appointment to have my braces adjusted. 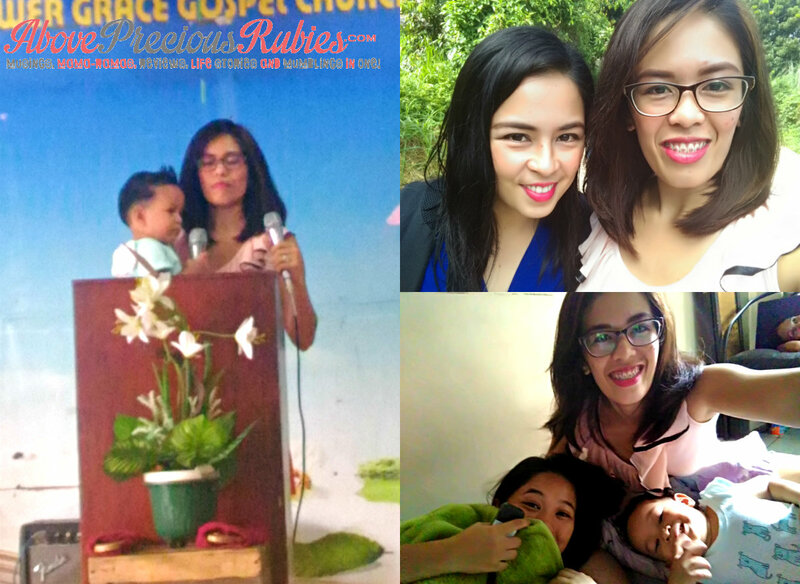 We dropped by Bjoy’s place to stay while waiting for Ate Anne (she’s our companion going to the dentist, we ride on her car going to there, lol. – thanks a lot ate Anne!). Bjoy was sick so she didn’t make it to church yesterday. We talked and watched a movie but we were unable to finish it. Get well soon, beh! My teeth is a work in progress, it’s under construction. lol. So every month, we go to Dr. Viray, our dentist to have our teeth checked and our braces adjusted. I am actually in pain since last night because of the newly adjusted braces. haha. I hope my teeth gets fixed right away. Lesson kids: always have your teeth removed when the secondary teeth are out, so that you will have a good teeth and will not need any braces when you grow up! Don’t be afraid! Save yourselves from the pain of having a braces! haha. Nate and I’s night ended with us finishing the movie we watched at Bjoy’s house. Good thing I asked for a copy. It’s the famous Zootapia that Nate and I watched. lol. Then we had a short video call with his Dane before going to sleep. It was an awesome weekend. Thank you Lord! I look forward for the next weekend. How did your weekend go? Oh, we should check Kids @ Play! My parents' house is near SM San Mateo, too. I'm excited to let my kids play there next time we visit my parents. Nako ga adik na din si Cloud sa shooting sa Time Zone naman. Kahit dito sa bahay meron na din kaming ring hehe. The Echong Dee and Kiray tandem is hilarious. I am so looking forward to watching their movie. Busy day. Loved the basketball time with the little man the most. Ihihi. Forgiven then on the no photos because you need to hold him. I also appreciated how quirky youve written each episode with lessons learned – like taking care of the teeth to avoid the hassle of braces. Ihihi. Reflects how happy a person you are. My weekends are mostly spent with family too and that's how I prefer it especially since we only get to see our teenage daughters every other weekend. 🙂 Good to know you had a fun time this past weekend with your own family. haha. That's good sis, magkakasundo to sila pag nagkitakita! hehe. Thanks! 🙂 I like your teeth Maan, nice kaayo! Akoa grabe ka maot, needs repair jud! lol! I watched their trailer, it's funny! haha! Thank you! Every time time spent with family is great!